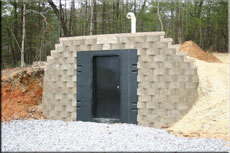 One of our storm shelters with a customers finishing touches added. We are currently building our website and some pages are under construction, but please feel free to look around and contact us via the information below or on the Contact Us page. Thank you.